Landfills are eyesores but they present a harsh reality of our wasteful ways. Even though we all are recycling like never before, what happens to all those acres of land that are now- landfills. I came across a great video that talks about how landfill owners are now installing solar panels on the acres of barren land devoid of trees. Hickory Ridge is one such landfill that was a big pile of trash on the outskirts of Atlanta, Georgia. But now, with its 10 acres of solar panels, it stands for renewable energy. 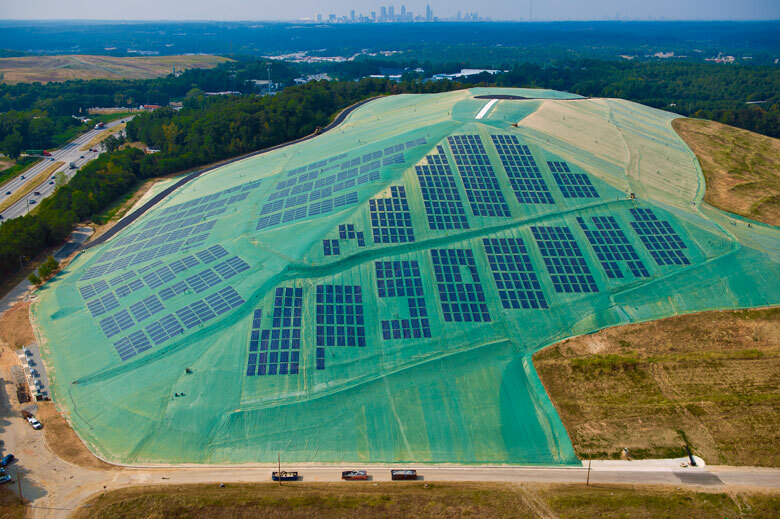 “When a landfill is (finished with) taking waste, it basically is dormant and there’s not a lot of uses for the property,” says David Stuart, area environmental manager of landfill owners, Republic Services, Inc.
“But its natural attributes — being a tall structure, out of the shadows of the tree line — gives it a unique advantage as a solar project,” he added. With the landfill closed to new deposits of garbage, Republic Services is required by law to monitor the facility for 30 years. So rather than let it stand as a closed facility, the company sought ways to reuse the site in some way. According to the U.S. Environmental Protection Agency there are around 100,000 closed landfills in the U.S. providing thousands of acres of land that could be used for renewable energy.